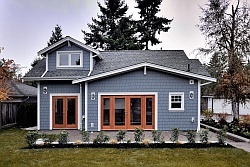 After attending a class on developing accessory dwelling units, Susan Moray was sold on the idea of replacing her alley-facing garage with a compact cottage. Susan’s home is a character bungalow located in Ladd’s Addition, the oldest planned residential development in Portland, Oregon. Because the garage was built with the house, city officials identified it as an original structure that contributed to the neighborhood’s historic character. The result was that it could not be torn down but the city would allow it to be turned into an ADU if two of the original walls were retained and the roof height was unchanged. Susan hired architect Jack Barnes to make the most of those restrictions. The roof height limitation was an issue because the garage had just 7′ tall sidewalls. Because of that, Barnes decided to use the existing structure for the bedroom and bathroom while putting the main living space in a new addition. The addition was dug a foot into the ground, giving it a more typical 8′ wall height. Open cathedral ceilings in both the old and new parts of the cottage maximize the room heights, making the small house seem quite a bit larger than its 550 ft2 (51.1 m2). Skylights in the living area, bedroom and bathroom bring in light from above, which tends to draw the eye upward, highlighting the vaulted ceilings. The skylights allow for natural daylighting without any loss of privacy. Ensuring that the occupants of both the main house and the new cottage would have adequate privacy was a priority for Susan. The cottage has its own private patio area at the side along with a screen to block views from the main house. The living space focuses on the patio with a four-section sliding door that serves as the cottage’s entrance. The living room also has a window facing the main house but it is placed high up in the wall. 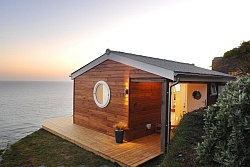 The bedroom is at the other side of the cottage so there was no choice but to have its window face the main house. The window sill also had to be low enough to allow use as a fire exit. However privacy was still maintained by putting the window at the far corner of the room and by garden plantings that effectively screen it. 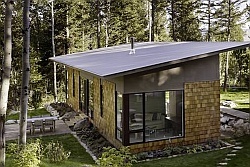 The small dwelling is kept comfortable by a hydronic radiant heating system in the stained concrete floor. Higher than average levels of insulation combined with triple-glazed windows keep the heat in. Water-efficient fixtures were also used, along with low-VOC finishes. 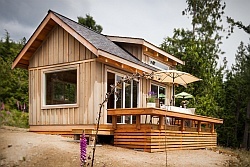 These measures earned the cottage a Platinum certification from Earth Advantage, a Portland-based non-profit that promotes sustainable building practices in the Pacific Northwest. The cottage cost $90,000 to build, an amount which Susan expects to recoup within a few years by renting it out to vacationers. 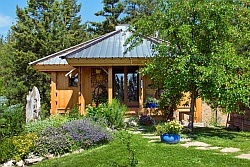 Speaking of which, if you’d like to stay there, please visit the PDX Eco Cottage rental website. Enjoy the photos and have a wonderful weekend! Photographs by Sky Rocket Photography, courtesy of PDX Eco Cottage. 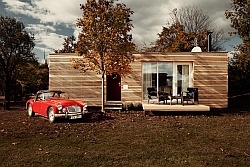 Via AccessoryDwellings.org. Awesome little PDX house. Love seeing small/little homes here in PDX. Being a PDXer myself, I really love to find these places and seeing what other’s are doing. One day hope to have my own little/small home here in PDX.